Garden furniture looks great when new but what happens when the colour fades, the wood turns grey or silver, or if a different colour shade or tone is preferred? Thankfully, a garden furniture stain can be used to change or restore the colour. What is a garden furniture stain? 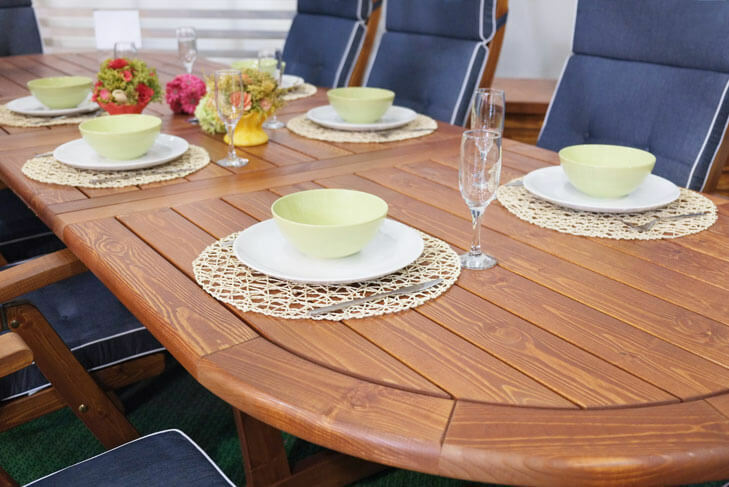 Garden furniture stains and oils produce a translucent finish, usually in the colour of other wood species such as Mahogany, Oak, Teak, Cedar and Rosewood to name just a few. Garden furniture paints are more about soft pastel shades and vibrant colour tones. Why and when to stain garden furniture? Garden furniture stains are usually used to restore the colour of hardwood garden furniture that has turned grey or silver over time, as a result of water and Sun exposure. Exposure to the elements strips and chemically alters the surface fibres, tannin and lignin in the wood that produce its natural colour. Some types of untreated wood can start to turn grey or silver in just months if exposed to high levels of UV rays, rain and moisture. Hardwood garden furniture sets can be expensive, normally hundreds or even thousands of pounds. A cheaper alternative is to buy softwood garden furniture, tables, chairs or benches. Being softwood doesn’t mean that they are inferior and if well looked after, could last for decades. One of the key issues with new softwood garden furniture is that it’s often untreated and made from light coloured timbers. Both of these issues can be addressed with a garden furniture stain which will both protect and colour the wood. Can any furniture be stained? If its bare wood then the short answer is yes. Previously treated garden furniture can usually still be coloured or stained but previous treatments need to be taken into consideration. For example, a varnish type stain or paint generally can’t be used over wooden outdoor furniture that has been previously oiled. Garden furniture previously oiled with a clear wood oil however can be stained with a coloured garden furniture oil. Previously varnished or painted garden furniture cannot be oiled unless it is stripped back to bare wood. It can usually however be repainted with the correct preparation. With any type of garden furniture stain, the key to a professional looking finish and one that will last is in the preparation. Before staining garden furniture, it’s important to ensure that the wood is ready or has been prepared for the stain treatment. The following advice gives the best approach for various types of outdoor furniture, new and old, bare wood and previously treated. New, bare softwood garden furniture should need little, if any preparation. As long as the timber is clean, dry and free from surface contaminates, it is ready to stain. If the wood has become dirty or greasy, it can be wiped down with a lint free cloth and methylated spirit to remove any surface contaminates. This will help to ensure a more consistent colour and finish when staining. Any traces of mould, algae or fungi should be treated with a mould and mildew cleaner to ensure that it doesn’t return soon after staining. New, hardwood garden furniture is usually supplied pre-oiled and shouldn’t require staining. If a darker colour is required, the furniture should be allowed to weather for several months or wiped down with methylated spirit prior to applying an oil-based furniture stain. Things worth considering are that the existing colour of the furniture will influence the final colour of the stain. Water-based stains or paints cannot be used on furniture that has been oiled unless it has been thoroughly sanded or stripped. Always do a test area in an inconspicuous area such as the underside of the table or a chair to test any stain before starting any project. Garden furniture that has been previously varnished or stained can usually be re-painted or varnished as long as the original coating is intact with no signs of cracking, flaking or peeling. If this has started to happen then its a good bet that moisture has penetrated into the wood and is lifting the finish from beneath. In these situations the best approach to ensure that the new finish will last is to remove the old coating, re-sand the wood and treat it as new, bare wood. For more information on garden furniture paints click here. An alternative to staining garden furniture is to restore the original colour of the wood. Wood restoration products chemically reverse the effects of UV damage and weathering to restore the original colour of the wood. Once restored, wooden furniture can be treated with a clear garden furniture treatment to enhance the natural colour and protect the timber. Wood restorers / revivers require some elbow grease to scrub the restorer into the wood. Outdoor wooden furniture that has been grey or silver for a umber of years may require a second application for the best results. 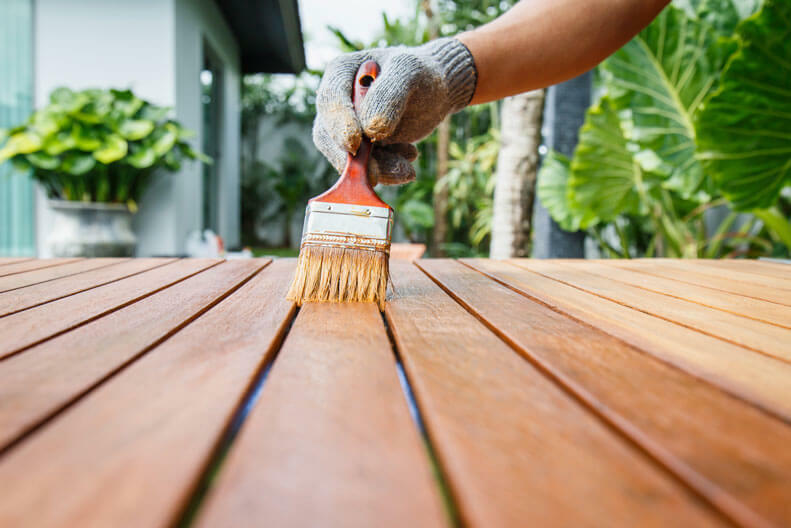 In addition to dedicated garden furniture stains, there are alternative products that can be used to colour and protect softwood and hardwood garden furniture. Odd as it may sound, decking oil is a great way to colour and protect wooden garden furniture. Highly durable and weather resistant, decking oils often contain UV filters and are great for bare wood or previously oiled furniture. Available in a wide range of wood-tone colours, they are easy to apply and maintain. Just as with decking oils, coating type decking stains are also a great way to colour and protect outdoor garden furniture. Also highly resistant to weathering and durable, with many containing UV filters, these types of ‘varnish-like’ stains are only suitable for new bare wood furniture of garden furniture that hasn’t been oiled for a number of years and stripped back to bare wood by sanding. For opaque pastel shades and vibrant colours, we recommend using a dedicated garden paint. Garden paints are best suited to bare wood or wood that has been thoroughly stripped or sanded. They are not suitable for wood that has been waxed, oiled or treated with products such as wood preservatives that contain wax, oil or silicon. This largely depends on the type of stain used. Oiled furniture is by far the easiest to maintain. Once the finish starts to look worn, faded or like it’s losing its water repellent properties, all that is required is a thin application of oil-based garden furniture stain to restore the look of the furniture. Some varnish type wood stains are designed to erode over time with a wear layer. The key to these stains is to ensure that the finish does not wear down to the wood and is re-coated inline with the manufacturers guidelines. Failure to maintain the coating or if the coating is penetrated by a sharp object can result in the failure of the finish. This often means that the stain has to be fully removed back to bare wood and stained again. Looking for help and advice on how to care for other wooden garden fixtures and fittings? See our advice and tips on looking after garden sheds, wooden decking and garden fence panels.